Windows Explorer is best for viewing the data on your PC. But if you are a power user or you need to open many windows explorers at once then Clover can make it easy to handle all those explorers in a single window. 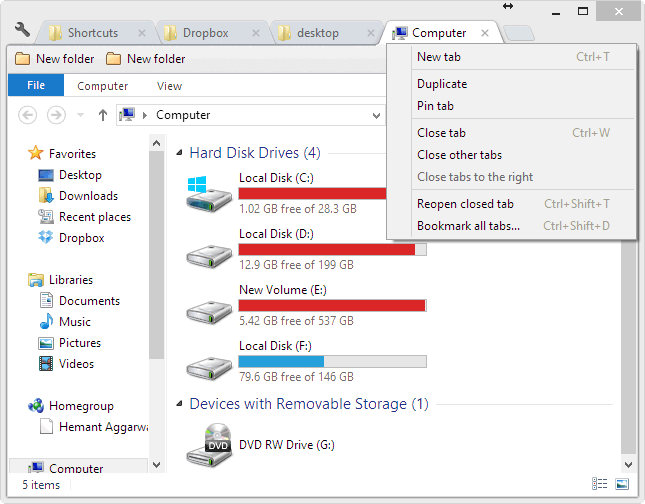 It adds tabbing to the Windows Explorer same as the one you find in Google Chrome. All the keyboard shortcuts it is packed with, makes the navigation quite easy. Open as many explorers as you want in the form of different tabs, all in a single window, same as in Chrome. Bookmark your most visited places for faster access. You can also arrange them in folders (I have made two folders named “New Folder” and arranged my bookmarks in them). You can also bookmark all the opened locations with a single click. You can also open all the bookmarks in a folder as you can do in Chrome. Just right-click on a folder and click “Open all bookmarks”. You can rearrange bookmarks and folders once made and renaming of the folders or the bookmark titles is also folder. The official site for Clover is in Chinese, but here is a Google translated version in English. Once you click the download link Google will show you an error that the page was too large to translate. Just click on “See original page” and your download will start. P.S. I personally like the Windows Explorer over any other third-party application, but the only thing missing in it was the tabbed browsing. Clover is the thing to go for if you need to open many windows explorers at once. The software is completely free and you must give it a try for sure.